Right after leaving the Iron Mosque in Putrajaya, I decided to bring my Filipino friend for a boat cruise on the man-made Putrajaya Lake. I figured it would be the best way to see all the beautiful bridges and landmarks in Putrajaya without having to walk! Besides, I have never been on this cruise before, so it was a splendid idea! 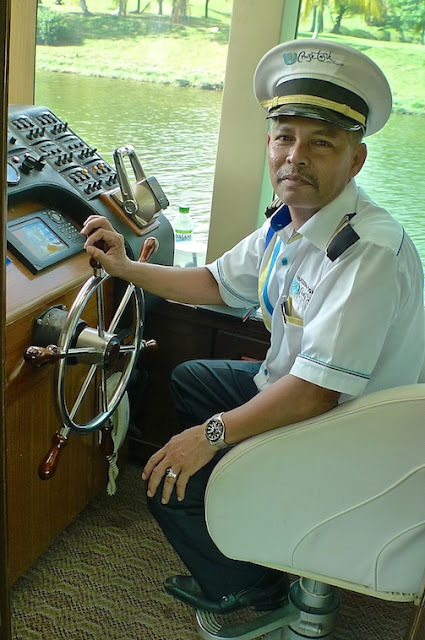 Known as Cruise Tasik Putrajaya or Putrajaya Lake Cruise, you have a choice of going onboard a modern air conditioned cruise boat, or the more traditional boats like the perahu or gondola. 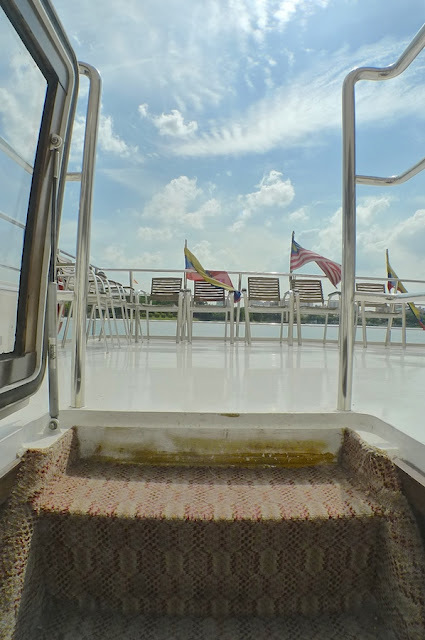 We chose the air conditioned cruise boat because it was a really hot day. But as you can see later, it does not really matter because we were up on the rooftop deck most of the time. LOL! The ticket costs RM30 for MyKad holders. I have forgotten how much it costs for non MyKad holders. At the scheduled time, we went on board the boat. Thankfully, there were not many people on the boat cruise that day. In fact, it was so empty we almost had the whole boat to ourselves! I think there were about 120 seats inside. We could sit anywhere we like as the boat was almost empty! The cockpit area with the steering wheel. The captain was not on board yet. Lol. That's another boat in front of us. As the boat was about to move, my friend and I decided to check out the upper deck. Looking up, we could see that we were just right below the Putra Bridge. I was wondering how many bridges we would be passing under! If you are not aware, there are altogether 9 bridges spanning the lake. I have covered 6 of them in my blog. Check them out HERE. From the distance, we could see the Putra Mosque which we had visited earlier. Read about this beautiful mosque HERE. We came back down for a while as the boat started on its journey. Look! The whole boat was practically empty! Haha! I was expecting a tour guide to explain and describe all the landmarks that we would be passing by but there was none. Later, one of the staff told me that the tour guide was sick so this service was not available that day. Really? Or was he lazy because there were only a few of us onboard? Anyway, we went back up to the upper rooftop deck. It was blazing hot but the wind helped to cool us down. It was much better on the upper deck as we could see everything around us more clearly. Soon we were approaching the Seri Wawasan Bridge. The Putra Mosque was already far behind us. That's my Filipino friend wearing a blue T shirt. Do you like the structure and design of this bridge? Read more about it HERE. We passed underneath the bridge and it was soon behind us. Ahead, we could see the Millennium Monument (the tall pole) and the Iron Mosque. I did not take any more pictures of the Millennium Monument. We were approaching the Iron Mosque. By the way, the Iron Mosque is so called because it is made of 70 percent iron and 30 percent concrete. Very unique, no? You may have read about my visit to the Iron Mosque but if not, read all about it HERE. A close shot of the Iron Mosque with its beautiful architectural design. The third bridge we would be passing is this one - the uncompleted Monorail Suspension Bridge. A beautiful bridge for the train to pass by but unfortunately the train project never got off the ground due to financial constraints. What a pity! Read all about this bridge HERE. My friend taking a picture of the bridge as we passed under it. Soon it was behind us. Can you see that the bridge is not complete? A couple more shots of the bridge as we left it far behind. The fourth bridge we would be passing under is the Seri Saujana Bridge. This is an impressive looking bridge and one of my favourite bridges in Putrajaya! You can read all about it in my blog post HERE. As we passed under the bridge, we could see how majestic the structure is. Almost like a giant spaceship hovering above us. And before we realised it, we had already passed it by. I was so glad there were not many people up on the deck as this gave me the freedom to take as many photos as I like without any obstruction. In the distance, we could see the PICC (Putrajaya International Convention Centre) building that looks like a UFO to me. A closer shot of the PICC building. Next to the PICC is the yellow-colored Seri Gemilang Bridge. Beautiful buildings with nice architectural design. This Seri Gemilang Bridge is another one of my favourite bridges in Putrajaya with its unique design. The scenery next to the bridge. This bridge connects motorists coming from the core island to the PICC building. You can see more pictures and read more details about the bridge HERE. This is how the bridge looks like as we passed underneath. Soon, it was behind us. The boat was now moving at a slower pace. I sat down and relaxed, enjoying the beautiful buildings and their unique architectural designs. How many bridges have we passed? I have lost count! OK, let me see... the Seri Gemilang Bridge that we just passed is the fifth bridge so the next one would be the sixth! This bridge is called the Seri Setia Bridge. Can you see the unique pattern on the wall that shaped like those you can find in mosques? I did not visit this bridge on foot so I could not provide detailed information or more pictures of it. The pillars below the bridge have the same shape too. After this bridge, my friend and I decided to leave the rooftop deck and went back down. We rested for a while in the air conditioned cabin before making our way out onto the front deck. Took some pictures from the front deck. In the distance, we could see the seventh bridge - the Seri Bestari Bridge. I also did not visit this bridge on foot before so I do not have a write up about it. But it looks like a pretty normal bridge and I was not really interested. We went to the cockpit and spoke to the captain for a while and took his picture. And then this 'car' caught my attention. It's a boat that shaped like a car on wheels. Cute! Maybe I should sit that next time. LOL. Oh we had left it far, far behind as we surged forward. Our cruise was coming to an end. We were almost back where we started having made one big round the core island. 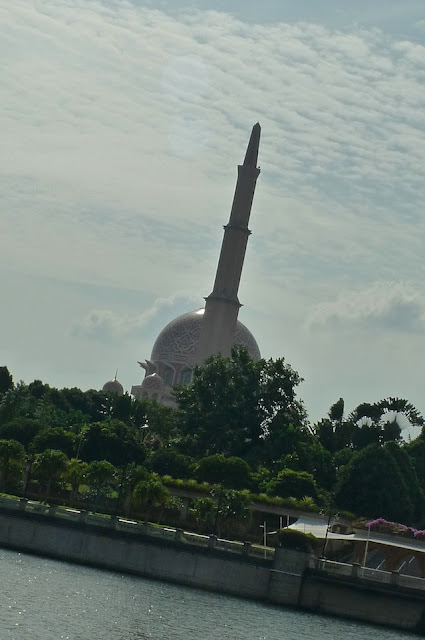 If you go to Google Map and type in 'Putra Mosque Putrajaya', you will see what I mean. From the map, you can see the core island and the lake that surrounds it. There are 7 bridges connecting the core island in the middle to the main land surrounding it. The cruise boat had passed underneath all 7 bridges. (Notice that earlier I mentioned there are a total of 9 bridges in Putrajaya? In case you are wondering, the remaining 2 bridges do not connect to the core island and as such, the boat does not pass underneath them). Look at this photo I took of the Putra Mosque. From this angle, it looks like a stupa, doesn't it? But of course, it's just as illusion. The combination of the tall minaret and the dome make it looks like a stupa at this particular angle. Lol. We were back at the Putra Bridge where we started. By the way, the Putra Bridge is the link that connects the core island to the Perdana Putra building that houses the Prime Minister's office. 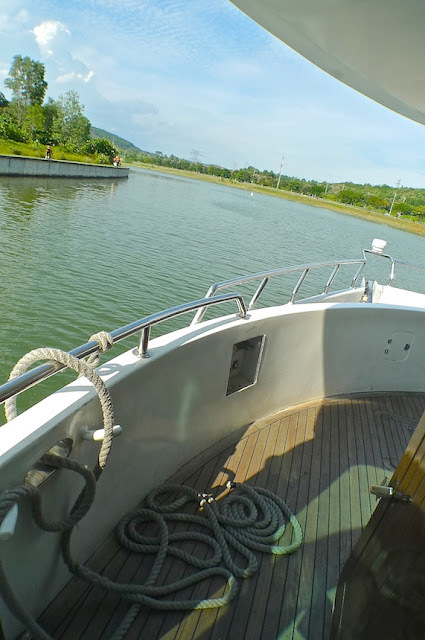 Our Putrajaya Lake Cruise ended here. It was an enjoyable cruise which would be more fun had it not been so hot! My advice if you plan to go on this cruise in the daytime (and especially in the afternoon) is to take along a sunblock with you. Unless, of course if you plan to sit inside the air-conditioned cabin throughout, which would be quite a shame. As we left the boat, we saw these 'car' boats all parked nicely here.